This was part of a series of papers given at the University of Toronto in competition for a position in the Celtic Studies department. This is a brief summary of a paper which focused on the reception of literature and the reception of the classics in medieval Ireland. There was an artistic and intellectual movement in Ireland where classical literature was translated into Middle Irish. The literature was primarily prose and used seven extant texts. The dates are difficult to discern and authorship doesn’t help because all but one are anonymous. Miles examined the the “Trojan Cycle”, known in Irish as, “Trogail troí” and the History of Alexander “Scéla Alexander”. Irish Alexander was probably contemporary with English Alexander. Why the interest in classical literature in Ireland? Irish scholars and monastics of the golden age influenced people well beyond Ireland. By the seventh century, the Irish were confirmed as competent Latinists. Irish Virgilian studies and the Filargirian tradition were taken up in the seventh century; the latter being a collection and commentary on Virgil. The other Virgilian tradition was Servian. 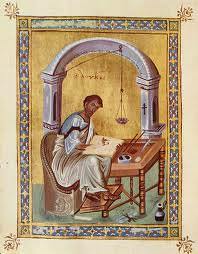 Services was a fifth century commentator with another commentary from the seventh century by Servius Danielis. Who read Virgil in medieval Ireland? Monks in Irish monasteries. Monastic writing came to the fore with the vernacular; monastics read Latin but translated into Irish. Secular writing was banned in monasteries but continued on undeterred in lay circles. These are the narrative sources for the history of Troy: Ancient Greek: Iiliad, Homer. Classical Roman: Virgil’s Aeneid, The Illias Latinas. Miles briefly discussed how the story of Troy survived into the Middle Ages and the examined the different renditions of the story over time. Trogail Troí had several versions in Ireland. It was re-written many times and only a fraction of this material was edited. According to Miles, “Irish writers had a sustained interest in Troy”. The Trojan Cycle in Irish consists of: Togail Troí, Finghala Chlainne Tanntail, Merugud Uilixis meic Leirtis, and Don Tres Troí. Miles also delved into the history and legend of the three Troys. Most Irish translations correspond to a single ancient text, the third Troy is unusual as it is not derived from one source. Troy was central to Irish classical studies in the vernacular period. Miles argued for a classical Pagan antiquity interest in medieval Ireland. There was a disinterest in Christian moralising in literature; Irish writing was overwhelmingly ‘secular in spirit’ and Augustine was used for historical purposes and not just for moral instruction. Unfortunately, the tradition was removed from the church because the secular writing was considered ‘frivolity’.